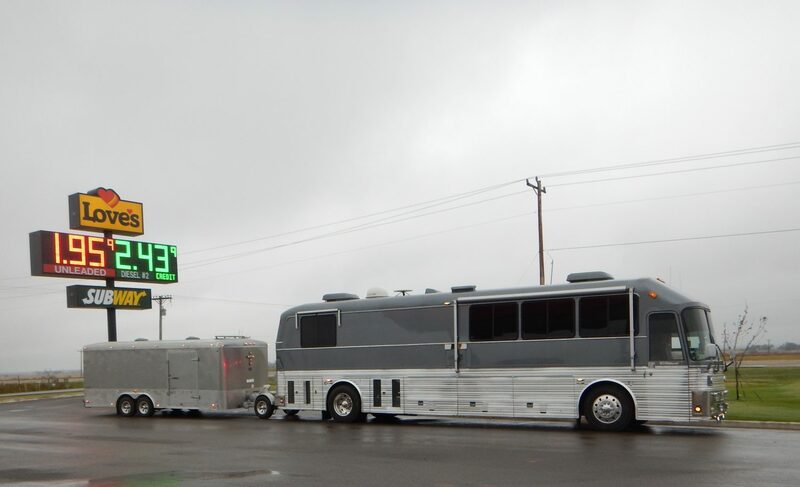 Kind of a hard pull into Amarillo Texas, wind was blowing fiercely, over in Santa Rosa, New Mexico it almost took us off the road, trucker wandered over to the shoulder, pinged the windshield, there will be $200 to cough up around December when the air turns chilly. An all White Eagle and a Prevo sitting in the parking lot, the usual assortment of cookie cutter fiberglass crap motorhomes each and every one equipped the same, the Hawaiian Skirt Splash Guard on the back bumper and two-wheel dolly car carriers on the rear. Each one with their bright orange, green or yellow ladder strapped to the back of the unit, another convoy of “Dust Bowl Okies” on the road to who knows where. But for the best part, the place is empty, picking and choosing a spot is not a problem tonight. Locating 42 feet of level ground, I quietly and efficiently stake my claim for the next eight to ten hours. I quickly locate a place for our “trailer trash” and we set up to spend the night. That done and put away, my attention returns to the two buses parked nearby. The Prevo has the usual assortment of flashy paint and what I call “whoopee do’s” running up and down the sides of the coach, all around the entire length of the coach. After careful scrutiny of my untrained eye, I come to a conclusion. Looks like a Country Coach, maybe a Marathon, age and vintage unknown. It really doesn’t matter, both companies now defunct and shut down, casualties of the current economy. The government giveaway of the century just hastened the death of the American Dream it seems.Now the Eagle, the big bird next to her, she looks great. Kind of majestic in the dim lite of the China–World parking lot. I saunter over and take a peek at both, the mural on the back of the Eagle is a “Dream Catcher” (American Indian Artifact) looks well done, and the bus lines are all straight and true. Someone has put a lot of hours into this sweetheart and the TLC is quite apparent.